A century ago, in early 1917, Australian troops had already seen heavy fighting, on Gallipoli in 1915 and even more on the Western Front in 1916, which had cost some 23,000 lives. In July 1916 nearly 2,000 men died in the overnight disaster at Fromelles and a further 8,000 in the protracted blood-letting on the Somme, at Pozières and Mouquet Farm from late July to September 1916. Besides bringing widespread grief, these losses had already caused a crisis in voluntary recruiting in Australia and a divisive plebiscite campaign over the introduction of conscription for overseas service. Though strongly supported by Billy Hughes and practically all newspapers and churches, the proposal narrowly failed, resulting in the splitting of the Labor Party and Hughes’s eventual defection to form the Nationalist Party. Australian civilians, formally loyal to the empire’s cause, were becoming weary of the imposts of war and its effects on their lives. While Australians in 2016 rightly remembered the sacrifices on the battlefield at Fromelles and Pozières, the war’s impact on those at home was notably absent in official commemoration. Australians today seem wary of recognising the bitterness of the conscription campaign. In 2016, while generally deploring the need for Australian troops to have been committed so promiscuously to the slaughter of the Somme, they also seem vicariously proud that these victims had been volunteers. It’s almost as if acknowledging the controversy over conscription devalues the troops’ sacrifices, rather than celebrating the triumph of a democratic referendum in wartime. Either way, despite the attention devoted to remembering the Somme, the centenary of the conscription vote (on 28 October) attracted little popular or media attention. The year 1917 would bring even greater trauma. Internationally, with the entry of the United States into the war and the collapse of the Russian empire into revolution, 1917 would see events that would affect the world for decades to come. The French army mutinies and the Italian disaster of Caporetto, 1917 saw allied fortunes at their lowest ebb. It would also be the most stressful and costly year of the war for Australia. Australians would fight futilely at Bullecourt (twice), at the bloody but seemingly successful offensive at Messines, and in the three-month-long ordeal of the third battle of Ypres, expressed forever in the word Passchendaele, the name of the obliterated, mud-bound village where the Flanders offensive finally ended. By the year’s end, nearly as many Australians were to die in battle as had died in the war so far – almost 22,000. More Australians were to die in 1917 than in any year in our history, and most of them violently, and arguably for little gain. Even the successes in Palestine (at Beersheba, part of the third battle of Gaza, which brought the capture of Jerusalem) were countered by the debacles of the first two attempts to take Gaza. And as in 1916, the year brought further strife to Australians at home. While Billy Hughes gained government, now elected as a conservative Nationalist, the year saw a growing rancour as trades unions contested the war’s effects on their members’ wages and conditions. There was increasing propaganda, security surveillance and conflict, including the celebrated throwing of an egg at Hughes at Warwick, Queensland. 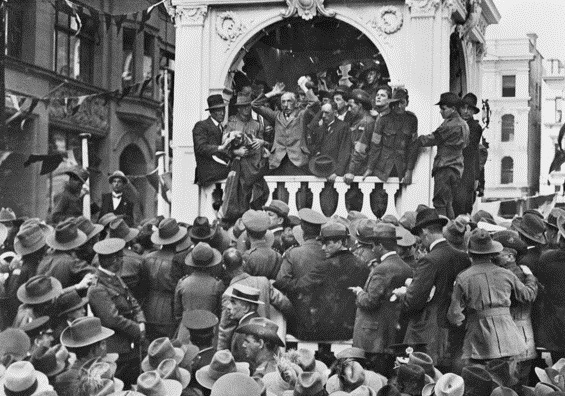 In the winter of 1917 there were food riots in Melbourne, a growing anti-war (and not just anti-conscription) movement, and a ‘great strike’ that paralysed transport in the eastern states, a reflection of the divisions the war increasingly drove between civilians. In December, Hughes again put to the people the introduction of conscription, and once again it failed, with a larger no vote and amid greater acrimony. Australians would vote for Hughes, but they would not vote to compel men to fight in the empire’s war. What of this story will we hear in 2017? If 2015 and 2016 are any guide, we’ll see ceremonies at Bullecourt, Messines, Beersheba and Passchendaele—and rightly, given the magnitude of suffering those names represent. We ought to recall places and events that cost or affected the lives of thousands of Australians. But will we as a nation also recall the magnitude of the war’s effects on most Australians, at home? Will we see a ceremony in Melbourne remembering the hardship that drove women to march demanding bread (shades of St Petersburg)? Will we see ceremonies at Holsworthy recalling the imposition of internment for German-Australians, or a memorial recalling the division of the ‘great strike’? Probably not. I deplore the shortsightedness that fails to see that the world’s first ‘total war’ affected Australians at Warwick as well as Wipers; at Bathurst as well as Broodseinde. Peter Stanley is Research Professor at UNSW Canberra and one of Australia’s leading historians of the Great War. Edited image courtesy of Australian War Memorial.